The Senegal national football team, nicknamed the Lions of Teranga played their first international against the Ivory Coast in Benin losing 3-2 on the 31st December 1961. They reached their first and only World Cup Finals in 2002 and made quite a name for themselves defeating World and European champions France 1-0 in the tournament's opening game but went out in the quarter finals. The club's best ever played is Henri Camara who played 99 matches for Senegal scoring 29 goals in the process. Senegal are one of the dominant nations in the CAF Confederation as the current roster features several world class players including Papiss Cisse, Demba Ba, Moussa Sow, Mohamed Diame, Mame Biram Diouf and Ludovic Sane. 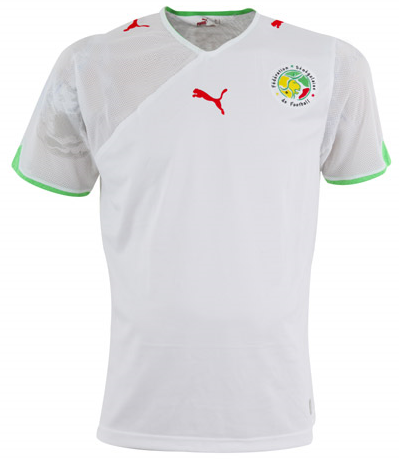 The nation wear an all white home kit with green and red trim supplied by German brand Puma.